We have been on the forefront in organizing the annual end of the year soccer tournament in Mathare North community for the last four years. Our main theme for this year is Mtaa bila Idleness, which means a community without idleness, as it was said an idle mind is a devils workshop. The tournament features sixteen senior teams that participate in the two weeks competitive tournaments with an aim of fostering peacefully coexisting of people in the community while embracing peace, love and unity despite of our background, tribes, political affiliation etc. 1. Soccer tournament for the senior teams. 2. Soccer tournament for U12 & U14. 3. Art expression; My country, My future for young people of 14 -16 years. 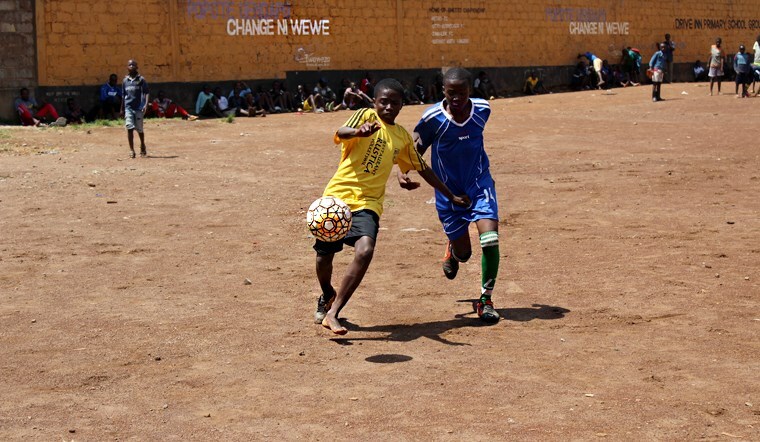 Soccer is the number one sport in majority of the informal settlements in the world. The power of a ball can’t be underestimated. Looking back history getting a real ball wasn’t easy, even though our creativity and innovation wasn’t limited we created soccer balls from pieces of papers and threads. We played together in school corridors, opens spaces, community field and even organized for friendly matches with other youth (soccer everywhere). These environments made us be known in the community, despite not having a structured soccer academies like in the western countries and through soccer some of us were able to arrive to our careers of choice and on the flip side due to social economical situations many talents were lost on the way. This year, schools have been closed for two months, many young people are all over the streets, some not knowing what to do or how to spend their time, parent on the other hand not knowing how to deal with their children during the long holiday. We have organized this tournament with the intention of creating a platform that will engage the youth in a meaningful activities that will train them some life skills that they wouldn’t get in the classroom. This is a platform that will bring young people of 14 to 16 years together at the GoDown Art centre on the 11th of December 2016. Our main theme My country, My future aims at creating a positive dialogue that will promote the values that will foster peacefully coexisting of people. Next year we will be having the general elections and from the street talk and media there is little evidence in organizing a celebration of things that bind us together as Kenyans apart from the forthcoming Jahmuri day celebration on 12th December (Independence day) which is gazetted. It is so unfortunate the small gains and activities such as what we have organized doesn’t get the attention in the mainstream media, majority of top news is when remarks are made that are controversial to the norms are made especially towards polarizing us further through tribal affiliations, political affiliation etc. Thanks to the new media, we are able to share our passion, activities and create platforms that appreciate our diversity as Kenyans even in a little way and as key stakeholders of the Kenya that we want to see. Our target group (14 to 16 years) won’t vote come next year, but we want to start somewhere by inculcating a culture of a new generation that appreciates our diversity, make informed decisions and promote the great values of peace, love and unity (peace ambassadors from within). For a great nation to meet its development agendas, we need the effort of everyone without excluding the children and the youth, their energy needs to be linked to deliberate program and activities that will promote great citizenry. We work with renowned artist and community youth leaders in facilitating these workshops. 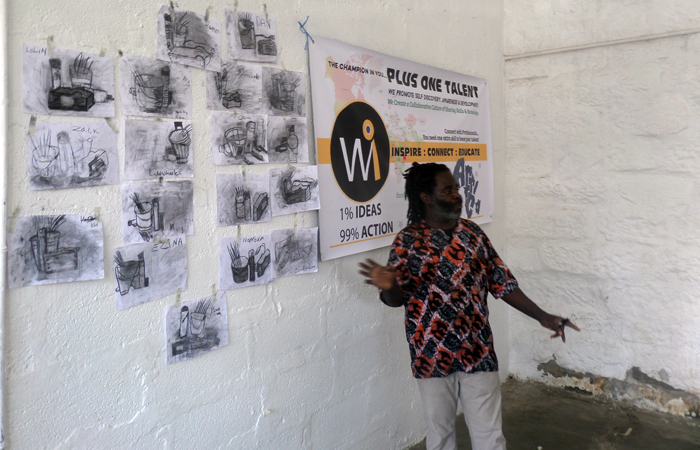 The participants get a chance to evoke new ways of thinking through artistic expression, work together and dialogue through meaningful conversations. We envisage a community of positive role models who are responsible to the community whereby engaging in activities that promote great values (Peace, love, unity, hard work, teamwork, empathy etc.) for a better tomorrow. After art and craft was abolished in the 8-4-4 system the interest of many young people participating in artistic projects has gone below the expected levels because some think it isn’t a career option. 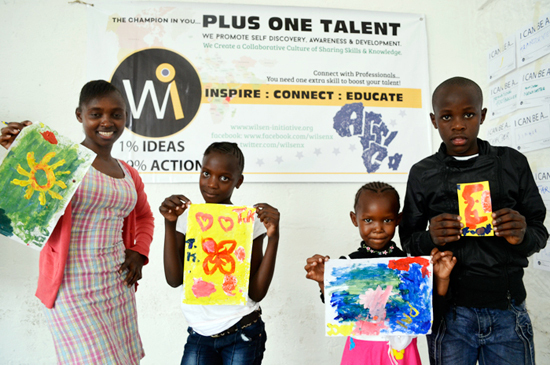 At Wilsen Initiative (WI) we promote art and soccer activities as our vehicles of delivering value through learning new skills that wouldn’t be trained in the confines of the classroom. Art is a wide field with many genres from music, painting, choreography etc. We use visual expression (painting) where the participants design their unique composition in relation to the subject matter. Art and sport are career options for the youth in the 21st century whilst learning other important skills that will make you an all rounder person. This entry was posted in Connectivity, Education, Inspiration, Sports Tourism and tagged Art expression, Football for Change by Wilson Masaka. Bookmark the permalink.